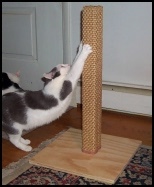 AWS30 Straight, 30" sisal weave scratching post no carpet. Shipped with base off. Easy attachment with no additional tools necessary. Save now by adding matching spare columns for only $48.50 each with no added shipping. If ordering TWO posts, find the the 2-PAK below & order that. NOTE: To avoid shipping delays, please select the appropriate zone for your state from the drop-down menu.